A lot of people these days like making bows out of PVC and other modern materials. The problem however is that PVC can sometimes split / break easily - often without warning - and I have seen it happen in person. As such I must admit my own personal preference for wooden bows. I made a variety of stick bows when I was a kid / teenager, and I admit at the time I knew very little about bow making. My thought at the time was that I needed really flexible wood, and when I made a bow out of such wood I discovered it broke easily. When I tried making bows out of harder woods they were impossible to bend. The few bows I made that actually worked did so for about 20 to 30 shots and then broke. So whatever I did at the time seemed to be a failure. If I had had access to the internet or books about bow making at the time I would have realized WHY my bows were breaking / so unbendable. It was really more a matter of the shape of the bows and the methods I was using for making them. I was trying to make bows out of found wood, that was often still green, had not been dried or seasoned at all - and I was basically just scraping the bark off of them and tying a string to them and trying to make a bow that would work. The only time I did successfully make a bow that worked properly when I was a teenager was when I made a crossbow - which likewise was too stiff to use properly because I had made the bow limbs too thick. Knowing what I know now I realize that "less is more" when it comes to bow making, that wood needs to be dried first, and that the shape and design of a bow is one of the singular most important features of a bow. Knowing what I know now I realize it is possible to build a stick bow (with the bark still on it and everything), but it is more important that I pick the right type of wood, and that I shape the stick in a manner that will make it a decent bow. A good wood for making a bow should be a hardwood stick that is dead and dry, but not rotten. If you find such a stick and it is not dry then you should dry it for a long time in a warm / dry place. Traditionally ash bows were dried for 3 years before making a bow out of them. Hickory, Elm, Ash, Maple, Locust and Osage Orange are just a few of the woods that Native Americans have traditionally used for making bows - and they all make excellent modern bows too. 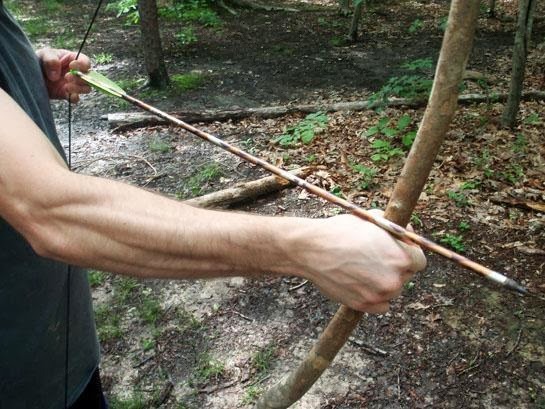 The easiest bow design to make is a longbow. Nothing simpler. If you try to make something more complicated without knowing how you will likely be disappointed. A shorter bow will need to bend more to reach your draw length and such a bow would likely snap / break more easily. Thus stick to making a longbow that is roughly your height. You will need a good long branch of thick or relatively thick wood that is 6 feet long or better. The rule of thumb is to make a bow that is the same height that you are. It should be straight - although a slight bow shaped bend is also okay, as that will be more forgiving when you are drawing it back. 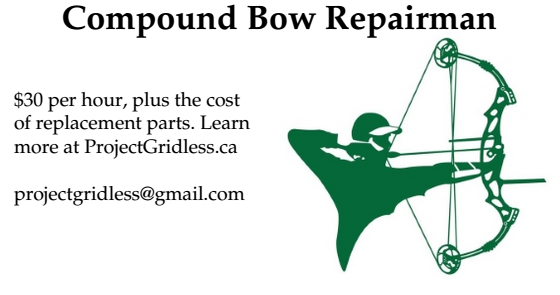 During construction you will want to tiller your bow so both top and bottom limbs spring and bend equally. In the past some people even tillered their bows by using a tree, but I recommend making a proper tiller if you can just to make it easier. See my post on How to Make a Tiller. Tillering is the art of thinning down the wood so that each limb of the bow bends equally, and also so that the bow has the desired draw weight. If the draw is too heavy, it is tillered down to thin out the limbs and lighten the draw. When making a quick stick bow you could do some fast tillering by carving down the inside of the bow on the thicker end of the stick. In paleolithic times this tillering was done by painstakingly scraping the wood with a stone scraping tool. Today we can carve it much faster with a steel knife, then scraping and/or sanding the wood. But if you want to shoot immediately, and the limbs aren’t too different in diameter, then it is time to string it up. A common mistake when making a bow is to think that a stretchy bow string is better. This is so wrong it cannot be stated more clearly: What you really want is something that is strong and doesn't stretch at all. This means cotton string won't work for you, because cotton stretches too easily. When I was a kid I remember trying to make bows using elastic, yarn, string, whatever was handy. I didn't know any better. Traditional bow strings are made from plant fiber, rawhide strips, deer sinew, dried intestine strips and other natural materials. But if you have access to modern materials I recommend sisal (which I used for making the bowstring my homemade crossbow). Other modern materials include 550 cord, or dacron. A traditional material that is still sometimes used today is silk - which is very strong and makes a good strong bow string and is resistant to stretching. So whatever you use as the bow string made sure it is very strong and does not stretch. How you decide to knot / tie the bow string to your stick bow is up to you. What matters is that the string should not come off easily, so use whatever works. A simple notch in the wood and a knot around the notch works just fine. If you want to get fancy learn how to do a Flemish Twist (which means you will need to make a Flemish Twist Jig out of a wooden board and some nails). When strung the bow string should be roughly 5 or 6 inches from the handle. If it is too close (eg. 3 or 4 inches) then it will likely snap your wrist whenever you shoot (ow!!!) and hurt your wrist. To fix this shorten the string so that the bow string is closer to 5 or 6 inches away from the handle. eg. In Summer 2013 I bought a longbow from Rudder Bows Archery and later discovered that the bow string when strung is only 3.5 inches from the handle. It slaps my wrist painfully every time I use it. To fix this I had the string shortened significantly so that it is now closer to 6 inches from the handle and it no longer hits my wrist. Honestly arrow making is arguably harder than making the bow itself. It is difficult to find good quality straight wood in the wild. I shall cover this topic another time as it will be a lengthy topic. Until next time have fun and keep shooting!